In all this hubbub about buying / selling / moving etc, I neglected to tell you all about a big milestone we have just reached. Since our trip to Calgary, which, you can ask my brother and sister in law, included more screaming and non sleeping on Mr. Pants’ part than sensible, we came home with a new Sleep Directive and decided to firmly grasp the reins of Kale’s little sleeping career, and make a change. First, we chose what bothered us the most. For me, it was the 45 minutes it took to get him to sleep with rocking, caressing, singing, patting, snuggling in our arms. For Ross, it was a tie between said 45 minutes and the fact that Kale was ending up in our bed nightly because he wouldn’t go back to sleep once awakened. So, we chose to sort out the going to bed part. 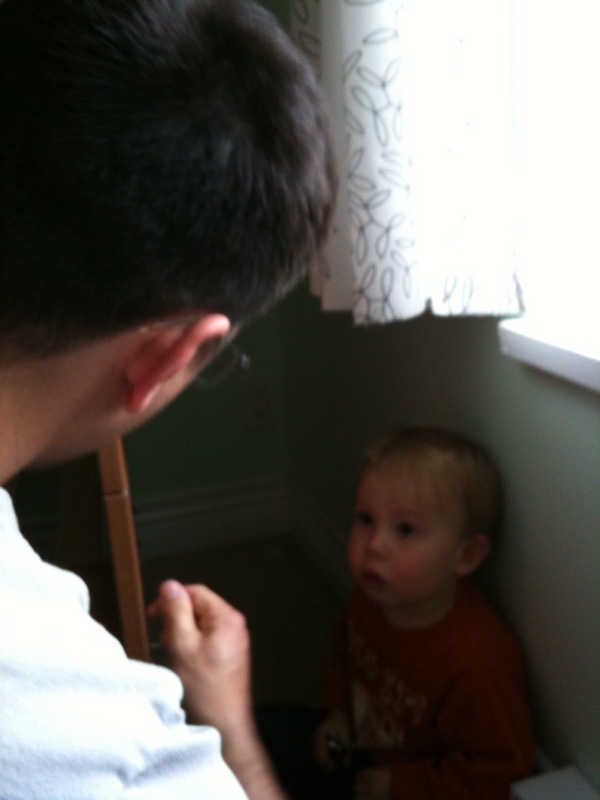 We agreed on a routine: bath (every second night), books, songs, and into bed. Period. If he wanted to lie there awake, so be it. If we walked out and he was still awake, so be it. If we had to go in and console him a million times, so be it. But no more of this pat down for 45 minutes every night. And he adjusted to that with ease. In fact, he welcomed it. Within a few weeks of 2010, Kale was essentially putting himself to sleep. We’d create the lovely sleeping environment, and pop him into bed, and walk away. We’d still have to go and tend him with regularlity – shushing him back to sleep, rearranging the blankets, retreiving the lost (damnable) sucky – but, flat out, we were pleased. We then started working on cutting out the coming to bed. Now, Ross is a significantly lighter sleeper than I, and as a result, night time attention has long been Ross’ realm. Yes ladies, I have had it good. My husband has retrieved the baby for nursing since day one. At around the same time of simply insisting that he stay in his crib, Kale just started sleeping longer and longer, and I don’t even know when, but eventually, sleeping through the night was the new normal, and not a sporadic miracle here at there. 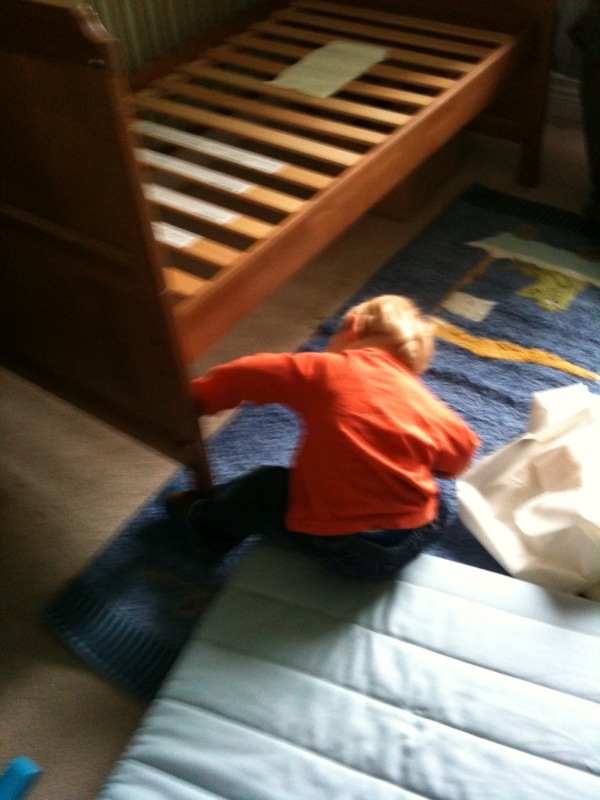 My friend Briana told me that her son just suddenly figured out sleeping at 18 months. And I chalk Kale’s miraculous embracing of the wonderful world of sleep to a combo of “this too shall pass”, “hey look I’m 18 months” and the work Ross and I did. 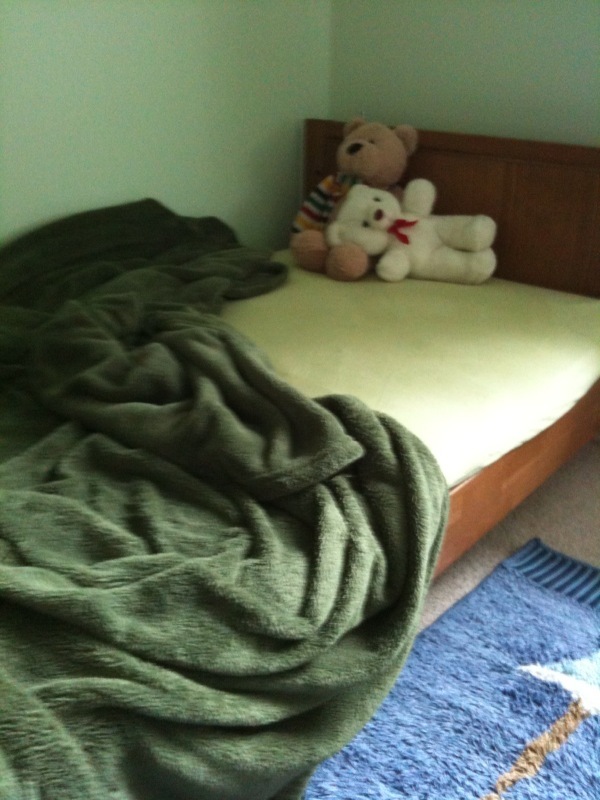 So, with moving to a new house coming down the pipeline, I started researching what the experts do when it comes to transitioning to a toddler bed, because I figured moving was going to be enough of an upheaval, why don’t we just add a toddler bed into the mix and do all the crappy sleeping transition all at once? It was logical but flawed. Because Mr. Pants decided he wanted to climb out of the crib about a month ago. And while he was never fully successful at climbing out, there was more than one occasion when I would be walking in as he was falling out. (Isn’t that a Bruce Springsteen song?) So we were given two choices: lower Kale’s crib to the lower height, or turn it into a toddler bed. And shorty me said “there is no way in hell I am going to drag a step stool in here whenever I need to reach into a crib”. 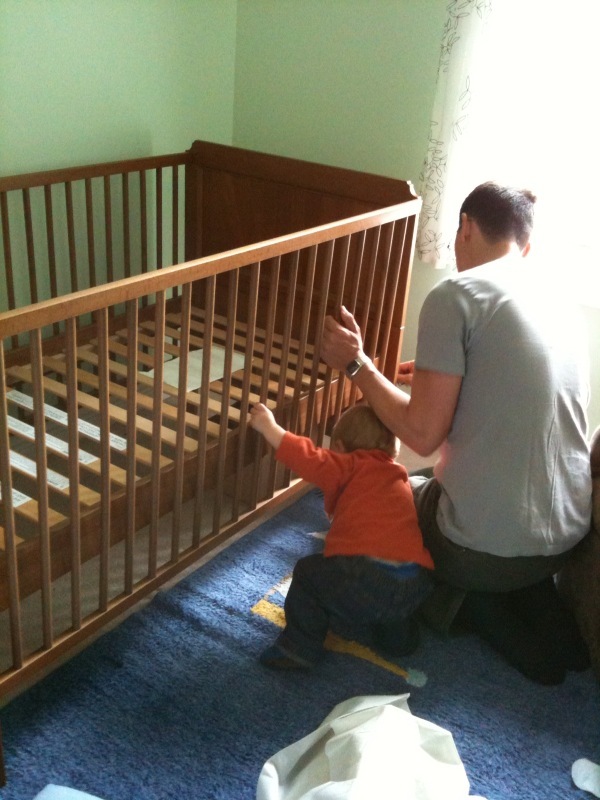 So, Ross and Kale had some tool time a few weekends ago and converted the Ikea crib into a bed. Cheese! I have a big boy bed! He promptly had a nap in the bed, fell out a few times, but otherwise LOVES his bed. He has fallen out a few more times since, but otherwise has taken to his bed like a duck to water. He sleeps more or less all through the night, asks to go to bed now, and even enjoys “hanging out” on his bed with a book. 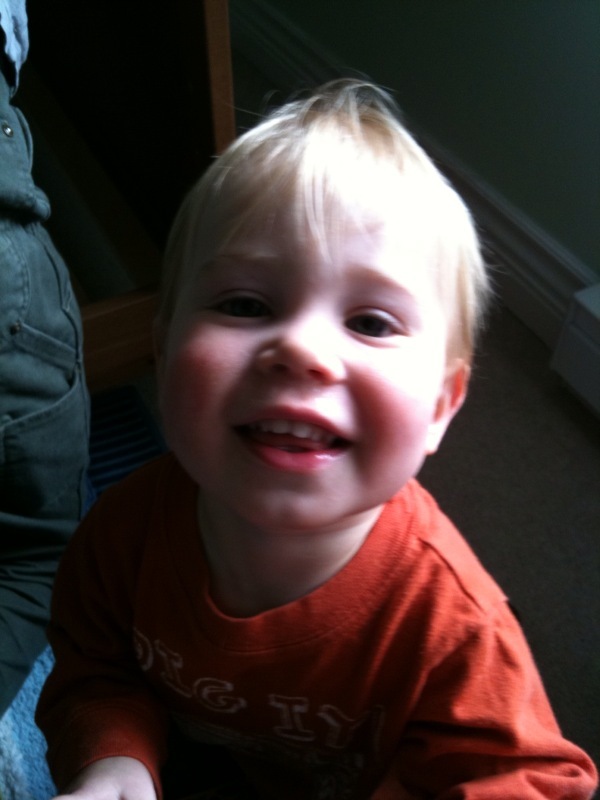 He gets himself up after nap or in the morning and comes out of his room all blinky eyed and cute. There was a time at the end of last year where I couldn’t see a light at the end of this sleep tunnel. I feel like we have actually left the tunnel. Welcome to good sleep, Mr. K Pants. You’ve earned it. 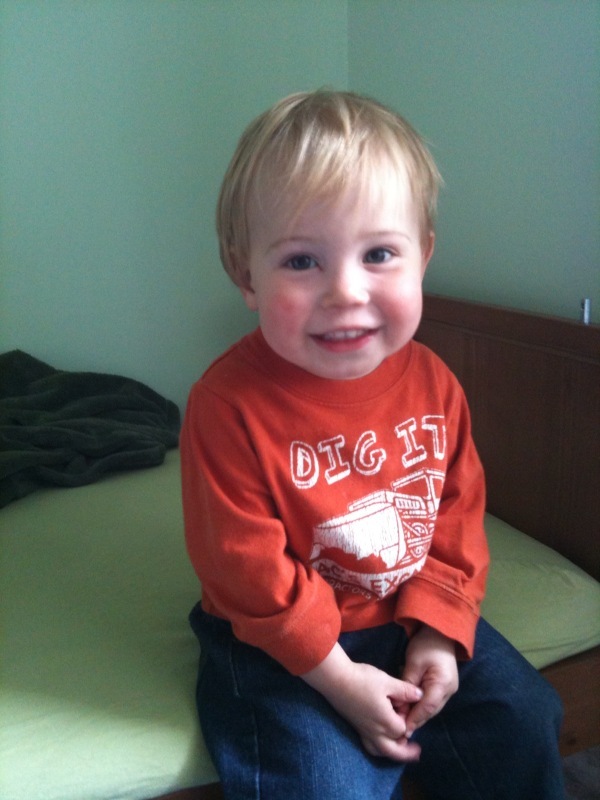 “Cheese I have a big boy bed” photo is hilarious! “Dig it!” I do. What an adorable child. And see, now when you have the second child you won’t have to do the whole “no, the BABY needs the crib!” business. It amazed me, after moving A to a bed, how long it took him to figure out he could get out of it. It was 5 months, I think. I do not think it will take E. ten minutes. Crib 4-evar. I must reiterate how tough it was for us (and Kale) to put him down at night during our Calgary trip. It nearly ruined our time away (and we don’t go away that often). I think that we were so afraid of messing with his previous sleep routine, our determination was a large part of the issue with Kale not sleeping well. He had grown and changed and we didn’t keep up. I believe that, if we changed his sleeping routine in, say, October instead of January, he would have been sleeping well earlier. And we would be “SUPER PARENTS”!!! Kale looks so pleased with his big boy bed! Adorable! And yay sleep!